@MIKLO - I fully agree it would be better if the jpg's were in the application folder, however they are not really hidden. In the current release the folder where the jpg's are stored can be easily opened and worked with under OPTIONS -> Open Temporary Folder. Hope this helps. Can the maker tell me why the jpg's wouldn't go into the application folder, makes no sense that they are so hidden. Unless I am missing something which I doubt. Can someone tell me where the .jpg images are left behind? I want to delete them but am unable to find them. Thanks. How about making network scanners visible? Lots of AIO network printers around. @allclownsareevil and Kea: Note added. Thanks, allclownsareevil. This is a real no no! Good program if you use it at home, but not if you use it to scan sensitive documents on a "public" computer. Please, add a warning to the entry - the jpg files remain even after many restarts. Good program. Could be enahnced by ability to save the JPGs it generates in composing the PDF file too. Another issue is that is saves the .jpg files in the temp folder even after exiting the program. I'd say this is a noteworthy issue being as you could be scanning personal documents, bank statements etc. Worked great with my old HP AIO. The "twain" option used HP's own software to do the scan, while the other option used WinScan2PDF's own tools, which included color, grayscale, black and white, as well as page size. Very useful program. The bulletin software deleted part of my example commandlines, so ask me if you want it. Seeing there are issues with this I stick to my well-established scanning procedure: Irfan batch scan - pdftk to combine the single page pdf scans Irfan produces. I need Irfan and pdftk anyway for many purposes, so don't need a new single-purpose program with issues, and Irfan and pdftk are portable. pdftk is a commandline program, and composing the necessary commandline (something like pdftk cat output or pdftk cat output is most easy with Free Commander portable, and having pdftk in the %path%. 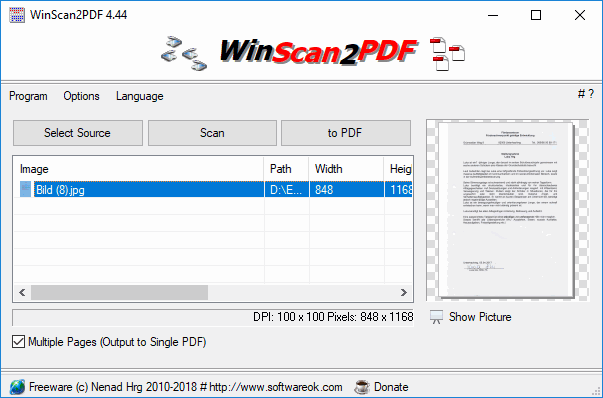 Winscan2PDF 1.45 doesn't work under my windows 2000 pro service pack 4 update 1. Reading all comments I can see that this updating must be checked and fixed. WinScan2PDF does not work for me. I'm using Win 7 64-bit with Epson Perfection V30. When i start WinScan2PDF, I can see it as a process in Task Manager, however, the program does not show any windows for me to use it. Still does nothing with my MX700. Shame, Ubuntu has a barebones app like this as part of its default install and I really like it. Was hoping something similar would come along for Win64 because the Canon apps that are bundled with it are bloated crap. My experience of using WinScan2pdf with a CanoScan LiDe 35 on Win 7 32-bit: scan proportions are obviously wrong, the width to height ratio being noticeably greater than it should be. Why? It *DOES* work with a Canon MP520. Canon MP520, does work on Win7x64. Canon MX700, doesnt work on Win7 x64.